Heat oven to 375°F. In large bowl, stir together brownie mix and flour. Add butter, egg and vanilla; stir until blended. Let dough stand 15 minutes for easier handling. Shape dough into 24 (about 1 1/2-inch) balls (dough will be soft). Place 2 inches apart on ungreased large cookie sheet. Bake 10 to 13 minutes or until set and tops appear dry. Cool on cookie sheet 1 minute; remove from cookie sheet to cooling rack. Cool completely, about 30 minutes. Spread 1 1/2 teaspoons preserves on bottom of 1 cookie; top with another cookie, bottom side down. Repeat with remaining cookies. 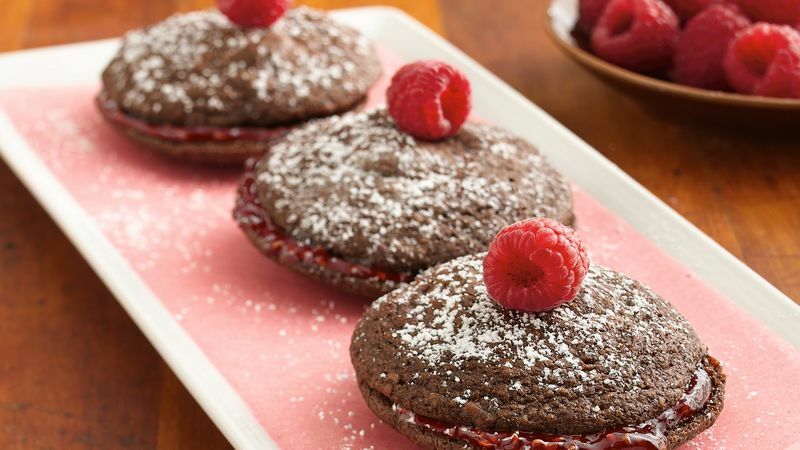 Sprinkle powdered sugar through fine-mesh strainer or sieve over cookies. Place on serving platter; garnish as desired with raspberries.